Every once in a while, I like to take some time out from salmon and tender stem broccoli to treat myself to a really naughty meal out. The other week, James and I took a trip to Grillstock in town which is the third smokehouse created by the Bristolean's who've also created the meat and beer festival of the same name. The idea of Grillstock is basically meat - smokey, sticky, loaded in barbecue sauce, super succulent and lots of it - and beer. Now I'm a classy lady (ha) so I didn't say 'hell yeah' to a bottle of beer, though I did to this epic share plate (yes, don't worry - this wasn't all for me!). 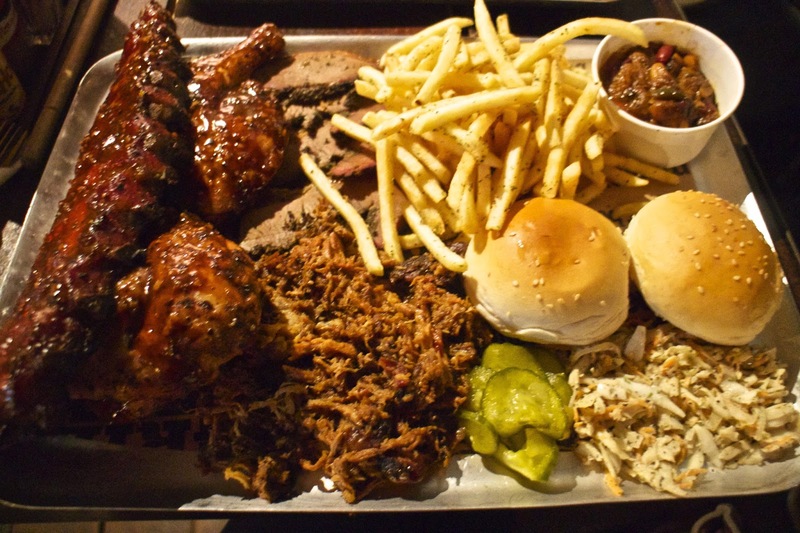 The share plate is stacks of pulled pork, brisket, a full rack of ribs, half a barbecue chicken and smokey and sweet BBQ beans. James quite easily managed to finish off his share of the meats, however as delicious as it all was I really did have power through! I took a particular liking to the ribs which is odd considering I've never really been a ribs fan. The pulled pork and BBQ beans were also dee-frickin'-licious. I would have happy just had a stack of both of those. The brisket was pretty tough and flavourless and went cold very quickly and the chicken wasn't the most succulent I've had though was still tasty nonetheless. The rest of their menu looks fab and I'm definitely keen on trying one of their Smokehouse burgers or Hot Dogs with a 'Fixin'' of chilli cheese fries (oh my word). The share board is a great idea if you're new to Grillstock and just want to try a bit of everything they've got on offer however. Situated right by the Bath Spa train station, definitely one to check out if you're in the Bath or Bristol area. Word on the street is it gets super busy on a Friday and Saturday evening. Wow this looks amazing so yummy! Oh. My. God. I'm with you, I do love tender stem broccoli - But if you are going to have a cheat meal, then this is definitely definitely it. Mouth watering....! Now this is my kind of food!! Yum! !